When considering a security camera system, it is easier to see the cameras in operation. Stop in and see the professionals at Platinum CCTV™ right around the corner from Aurora, IL and you will be able to see traditional CCTV cameras, HD-SDI cameras HD-IP cameras and complete systems. This combined with the expert advice from our technicians will help you select a system that will work well for your home or business. Security for your home or business is not an easy decision, especially with all of the options that are available. However, it is an important decision, which is why we take the time to walk you through all of the possible systems and cameras that will help suit your needs. Stop in our showroom, we are just around the corner from you in Warrenville. 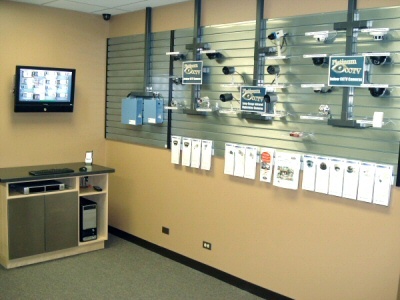 At Platinum CCTV, we can not only assist you in selecting a system for self-installation, but we can also schedule a time to come on-site to your home or business in Aurora, IL to provide you with a security assessment, provide installation services through our contractors, or even provide maintenance or repairs on your existing cameras. We work with all types of CCTV, HD-SDI and HD IP security cameras. Give us a call at (866) 537-5438 and we can schedule a time to visit you.